Last week Trump also tweet-shamed U.S. companies — saying they needed to step up their efforts to rollout 5G networks or “get left behind”. In an MWC keynote speech yesterday the European Commission’s digital commissioner Mariya Gabriel also signalled the executive is prepared to step in and regulate to ensure a “common approach” on the issue of network security — to avoid the risk of EU member states taking individual actions that could delay 5G rollouts across Europe. Huawei appeared to welcome the prospect today. “Government and the mobile operators should work together to agree what this assurance testing and certification rating for Europe will be,” said Guo, suggesting that’s Huawei’s hope for any Commission action on 5G security. Geopolitical tensions about network security have translated into the biggest headache for Huawei which has positioned itself as a key vendor for 5G kit right as carriers are preparing to upgrade their existing cellular networks to the next-gen flavor. But any competitive lead in next-gen network tech also puts the company in prime position for political blowback linked to espionage concerns related to the Chinese state’s access to data held or accessed by commercial companies. Huawei’s strategy to counter this threat has been to come out fighting for its commercial business — and it had plenty more of that spirit on show this morning. As well as a bunch of in-jokes. Most notably a reference to NSA whistleblower Edward Snowden which drew a knowing ripple of laughter from the audience. “We understand innovation is nothing without security,” said Guo, segwaying from making a sales pitch for Huawei’s 5G network solutions straight into the giant geopolitical security question looming over the conference. You can’t use “a crystal ball to manage cybersecurity”, Guo went on, dubbing it “a challenge we all share” and arguing that every player in the mobile industry has responsibility to defuse the network security issue — from kit vendors to carriers and standards bodies, as well as regulators. “Let me says this as clear as possible,” he went on, putting up another slide that literally underlined the point. 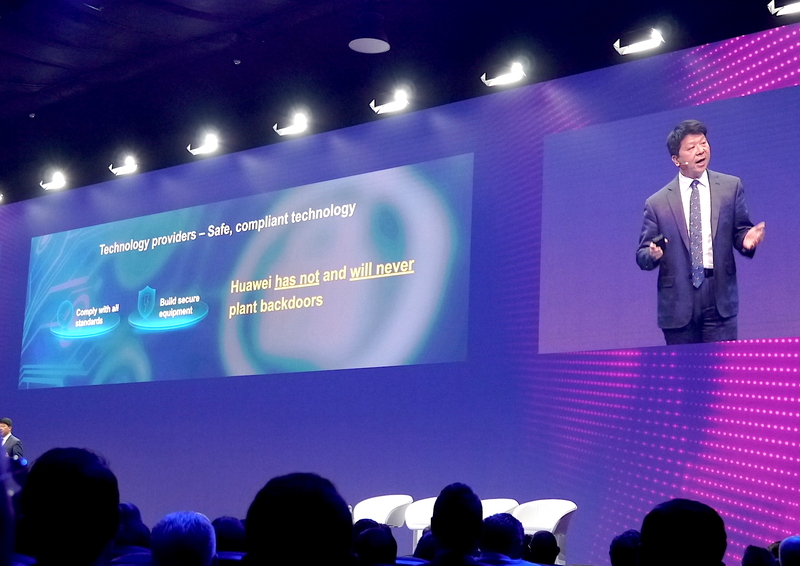 “Huawei has not and will never plant backdoors. And we will never allow anyone to do so in our equipment. Guo’s pitch on network trust and security was to argue that where 5G networks are concerned security is a collective industry responsibility — which in turn means every player in the chain plays a monitoring role that allows for networks to be collectively trusted. “Carriers are responsible for secure operations of their own networks. 5G networks are private networks. The boundary between different networks are clear. Carriers can prevent outside attacks with firewalls and security gateways. For internal threats carriers can manage, monitor and audit all vendors and partners to make sure their network elements are secure,” he said, going on to urge the industry to work together on standards which he described as “our shared responsibility”. “To build safer networks we need to standardize cybersecurity requirements and these standards must be verifiable for all vendors and all carriers,” he said, adding that Huawei “fully supports” the work of industry standards and certification bodies the GSMA and 3GPP who he also claimed have “strong capabilities to verify 5G’s security”. Huawei’s strategy to defuse geopolitical risk by appealing to the industry as a whole to get behind tackling the network trust issue is a smart one given the uncertainty generated by Trump’s attacks is hardly being welcomed by anyone in the mobile business. Huawei’s headache might lead to the industry as a whole catching a cold — and no one at MWC wants that. Later in the keynote Guo also pointed to the awkward “irony” of the U.S Cloud Act — given the legislation allows U.S. entities to “access data across borders”. U.S. overreach on accessing the personal data of foreign citizens continues to cause major legal headaches in Europe as a result of the clash between its national security interest and EU citizens fundamental privacy rights. So Guo’s point there won’t have been lost on an MWC audience packed with European delegates attending the annual tradeshow. “So for best technology and greater security choose Huawei. Please choose Huawei!” Guo finished, ending his keynote with a line that could very well make it as an upbeat marketing slogan writ large on one of the myriad tech-packed booths here at Fira Gran Via, Barcelona.